Something historic is happening in the salmon world that we should all take time to celebrate -- returns of adult fall Chinook salmon that quickly approached the 1-million mark. The amazing returns provide proof positive that the Northwest's collective restoration effort by federal and state agencies and tribes -- as well as the families and businesses who are shouldering the costs of this massive effort -- are paying off. As The Oregonian's Editorial Board noted, "the Columbia River and its tributaries are a testing ground for the largest and most expensive wildlife stewardship in the history of the United States." The federal salmon plan that the agencies and tribes are implementing to protect salmon listed for protection under the Endangered Species Act is by far the largest and most costly plan anywhere in the country, so it is most gratifying to see that hard work providing dividends. Good ocean conditions also are a huge factor in these fantastic returns. Salmon spend relatively little time in the Columbia and Snake rivers as they move downstream (on the order of 20 days or less) but live up to four years in the ocean. Despite all the obvious progress, fish conservation and commercial fishing groups have indicated once again that they will challenge in court the federal salmon plan (Biological Opinion) that is the foundation for all this headway. In fact, they suggest that it is precisely because of the plan that they will be forced to litigate. When the plan is clearly working, one has to ask: Why? What or who is dragging them into the courtroom? Consider the facts: the federal hydro system has undergone a $1.6 billion overhaul in the past dozen years, retrofitting the dams with new passage technologies that are getting young fish through the dams downstream at very high levels of survival. Hydro operations also have been radically changed to help salmon migrate downstream by "spilling" water through the dams, which means we are generating a lot less clean renewable energy. The states and tribes are halfway through implementing a $1 billion habitat restoration program on major tributaries to the Columbia and Snake rivers that is improving habitat for salmon rearing and spawning. That this has all been accomplished in just a few years can be attributed both to the strength of the measures in the plan and the collaborative way in which they are being implemented. The only thing that doesn't seem to change is the fish groups' desire to litigate. If there is lack of progress anywhere it would appear to be in their unchanging eagerness to go back to court. They suggest that even while the fall Chinook are experiencing a fantastic run, other populations are not doing as well. This is easily explained by simply applying some common sense. Salmon in the Columbia Basin come from many different tributaries with different habitat characteristics, go to different places in the ocean, return at different times of year and face different commercial, tribal and sport fishing harvest seasons. Some runs will do better some years than others. That is their nature. Here's why we all keep being dragged back into the courtroom: the litigants have been quite clear that the only salmon plan they will accept is one that includes the removal of the Snake River dams. This myopic attitude is discouraging because the odds of the Snake River dams coming out anytime soon are slim to none. It would take an Act of Congress -- which is highly unlikely. One of the only issues the Congress has been able to agree on in a bipartisan fashion is legislation promoting development of more clean renewable hydropower. And, Congress is well aware of the other irreplaceable benefits the dams bring to the Northwest, including the irrigation, trade and commerce that underpin our economy. People want and support a balance between helping our iconic salmon and sustaining our economy and quality of life in the Northwest, and that's exactly what we have achieved with this salmon plan. They also consistently and overwhelmingly oppose drastic measures such as Snake River dam removal. It's time to accept these facts and put all our efforts behind implementing a solid plan that is the best bet for salmon restoration. 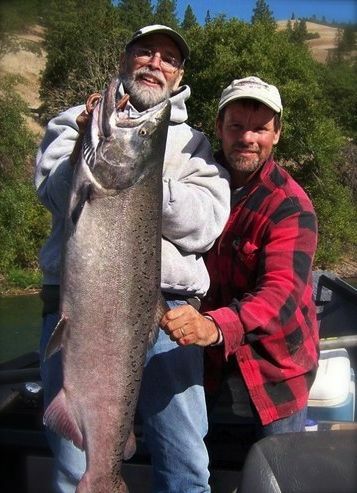 And, let's not forget to celebrate the results as evidenced with this historic run of fall Chinook. Terry Flores is executive director of Northwest River Partners, an alliance of farmers, utilities, ports and large and small businesses that rely on and promote the economic and environmental benefits of the Columbia and Snake rivers.